Picture a spacious but naturally lit room with projectors aimed at whiteboard-coated walls. The Emergency Manager sits down to immediately brief elected officials via a camera built into a large screen. The screen displays a series of images from a complex HAZMAT incident. An unmanned aerial vehicle (UAV) monitors the situation from above while simultaneously transmitting remote-sensing data back to the EOC and first responders. In a nearby cold zone, a structural assessment team discovers a weak floor joist; they take pictures of the damage using a specialized damage assessment app on their smartphones and send it to engineers in the EOC. The engineers review the metadata from the images, which contains GPS coordinates and altitude of the damaged area, and then determine that the building is structurally unsound. The Emergency Manager relays this information to the Incident Commander, who calls for an evacuation of the building and the surrounding area. In the EOC, a GIS specialist maps the affected area on an image projected onto an interactive smart-board and identifies potential cascading damages to surrounding infrastructure, as well as residents in the area who have indicated a need for special assistance during an evacuation. This image is then transmitted to the HAZMAT teams and displayed on the inside of their helmets, helping them anticipate additional obstacles. Simultaneously, a map indicating potentially vulnerable community members is displayed on an interactive-screen within the Incident Command Post, which is then used to determine the most effective route to evacuate the surrounding area. Support teams from the next jurisdiction arrive on-scene and are directed to a check-in station. The Staging Area Manager verifies responder credentials by swiping their badges across a sensor on a smartphone. The phone chirps and glows green for each approved individual but emits an angry buzz and flashes red when an unapproved card is scanned. Back at the EOC, Planning and Finance Section Chiefs use the timestamps from each approved responder to calculate time sheets and assess monetary reimbursement for the supporting agencies in real-time. As the incident response comes to an end, responders and equipment are demobilized and the Incident Commander requests that the evacuation be rescinded. The Public Information Officer launches the public notification app on a tablet computer and pushes the “send” button, which delivers a pre-scripted message via telephone and text to smartphones within the geographic area of the incident operations, an e-mail to all agencies involved in the response, as well as a coordinated press release that is simultaneously posted on the agency’s blog and social media sites. All of the aforementioned technologies may sound like fantasy, but many are currently under development and others are already deployed. 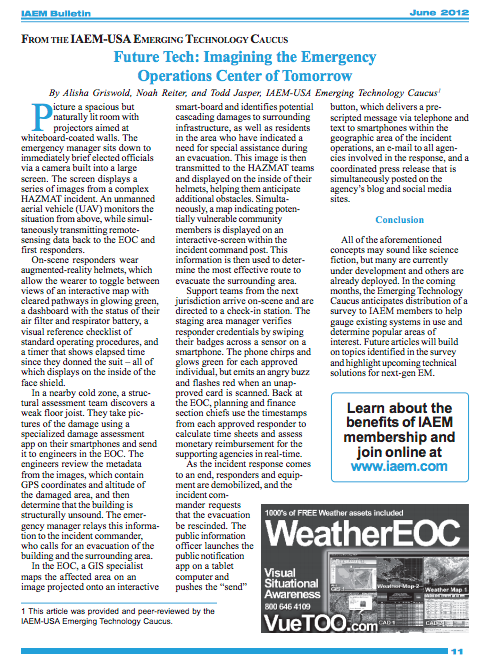 In the coming months, the Emerging Technology Caucus anticipates distributing a survey to all emergency management agencies to baseline the existing technology in use, as well as to gauge interest in emerging solutions. Future articles will delve deeper into those survey results and some of the technological solutions of tomorrow. I just read you article on the EOC’s of tommorow. …. Great article ! Now if we could only finance a system like that in the real world. Having been in both emergency management and in emergency response, I can tell you that an EOC is almost worthless to an incident commander in the early stages of an incident simply because they do not have information. A package like the one described in the article solves that problem and allows an emergency manager to immediately bring resources to bear to handle an emergency. Thanks for the great comments Terry!